Ankur Scientific offers a completely new process for gasifying coal. The systems offered use a Downdraft process instead of the conventional updraft process. 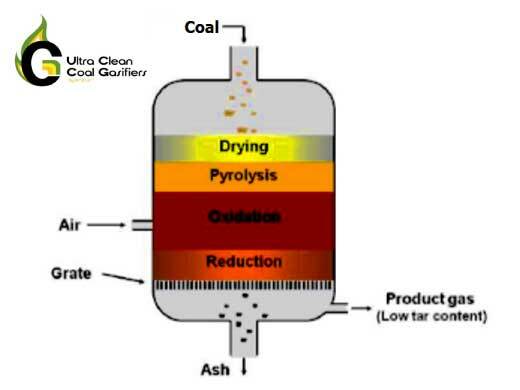 The updraft process (as is used) is one where the coal is fed into the gasifier from the top and the gas is also taken out from top. This leads to the gas entraining a lot of tar along with it as the gas needs to pass through the Pyrolysis zone which is where the tars come out. In the downdraft process on the other hand, the coal is fed from the top while the gas generated is taken out from the bottom. This leads to the gas being almost tar free. Systems need no steam and are in negative pressure. This ensures that there are no pressure related issues or explosions. Thus much Safer. A State-of-the-Art Dry Gas Cleaning Technology is used to cool and clean the gas, depending on the application. Thus the systems are environmentally sound as not only do they not generate tars, but also because there is no water that directly comes in touch with the gas for cooling and cleaning (thus no process water is created). The system is completely PLC controlled allowing for safeties leading to system alarms, shut downs etc. If there is any other types of Coal available in any region, the specs or some samples could be sent to us. We can review and confirm the possibility of using it in our Coal Gasifier. Click here for details on select ratings of this Gasifier series. Other ratings also available.